Like a lot of engineered products, patio doors made or designed by German systems companies enjoy a reputation for quality and reliability. German bifold patio doors are no exception. Brand perception is important from a marketing perspective, but these German made products are also popular with fabricators and installers because their superior design means that they are easier to manufacture and more reliable once installed; meaning fewer service calls. 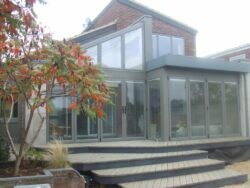 In this article we explain which German Bifold Patio Doors are available in the UK and give some detail about each product. What German Bifolding Patio doors are available in the UK? To begin with, there are four residential bifolding door products sold in the UK as German systems. Some of these are made in Germany, others are German designed and made in the UK. There are also other brands of German doors mainly available for the commercial markets. We focus in particular on the four most popular brands of doors for the home. There are seven premium SUNFLEX bifolding doors available in the UK. 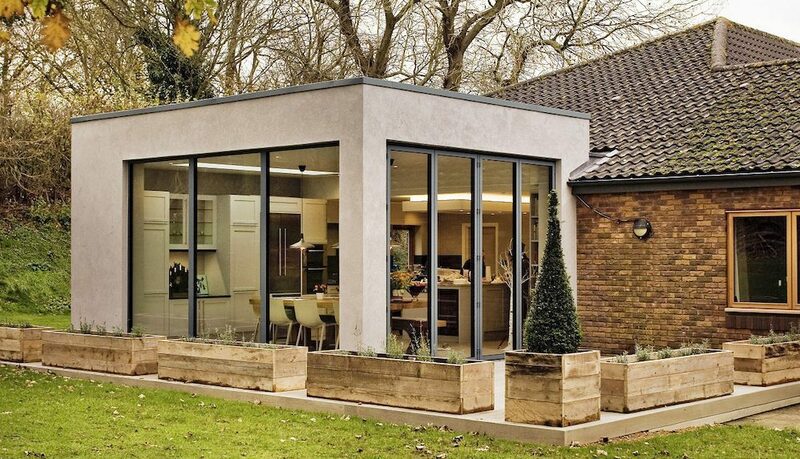 These range from full aluminium, to hybrid bifolding doors as well as timber. There are also internal bifold doors. And SUNFLEX provides one of the most comprehensive ranges for general patio doors for the home. SUNFLEX bifolding doors come to the UK only made in Germany, delivered to a nationwide network of approved SUNFLEX dealers. The benefit of a SUNFLEX product is big door sizes, one of the slimmest bifolds on the market as well as some of the best hardware and operation of any bifolding door. We recommend you consider SUNFLEX alongside any of the best bifolding doors available in the UK. The award-winning SF55 and SF75 SUNFLEX doors are also unique as a German made product with a BSI Kitemark certificate too. One of the best known brands of bifolding doors in the UK. A Schuco bifold offers excellent engineering, slim slight lines as well as an excellent range of contemporary colours. Also, Schuco bifolding doors come in several different variants, such as the well-known ASS70FD, the higher insulation ASS80FD. In spite of their massive German perception, Schuco doors are not made in Germany. Many different manufacturers all over the UK either make or supply these German bi folding doors but make in the UK. Schuco as a business is based in Milton Keynes where the aluminium profiles and extrusions go to their nationwide network of fabricators. Some bifolding door suppliers such as Kloeber and Express Bifolding doors offer Schuco products, rebranded under their own names as well. One of the most compared products to Schuco is the Origin bifolding door with many installers offering both brands. Another premium product amongst German bi folding doors is Solarlux. Solarux offers 1o different bifolding doors, also including wood and wood-aluminium hybrid doors. Every Solarlux product comes made in Germany and delivered to the UK, through a network of quality home improvement companies. The Solarlux reputation is excellent. In fact, world-class architects such as Herman Hertzberger and Foster and Partners using Solarlux doors. The Solarlux SL 82 is an excellent example of the innovation that goes into these German bi folding doors. SL82 offers a heat insulated product, with a near frameless appearance as well as just 8mm visible aluminium sight line. In addition to the well-known brands above is Weru; established over 170 years. A less well known brand in the UK, but Weru offers quality German made bifolding doors and general home improvement products. Weru is furthermore credited with being pioneers of PVCu windows as early as the 1960s and now provides a premium range of bifolding doors, front doors, sliding doors and many other products. The Weru bifolding door comes with narrow sight lines and rounded profile edges as standard as well as low U-Values. Also available are, wood effect finishes and a low threshold. 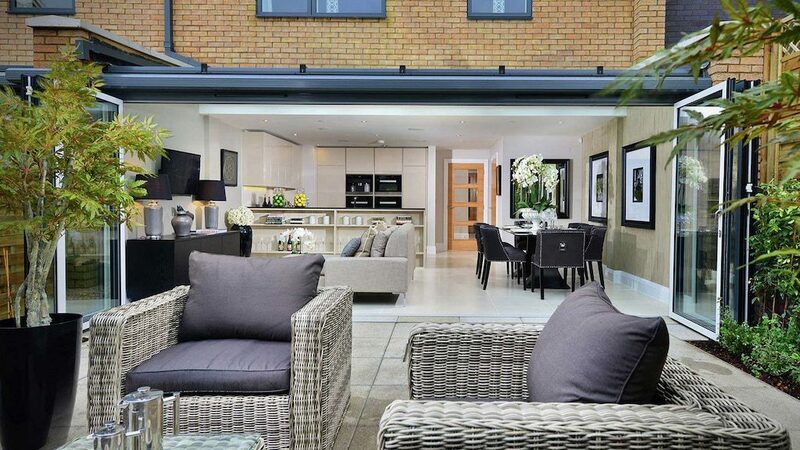 Weru Bifolding doors come from a network of UK distributors. What are the best German bi folding doors? 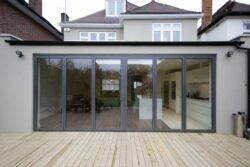 Choosing between these four aluminium bifolding doors comes down to a number of factors. They are all excellent and worth considering. Every one of these sought-after bifolding doors is well-designed with impressive aesthetics, capability and specifications. In our view, there are four key areas to examine, before choosing any of these brands. Firstly, any of these doors correctly made and installed will transform your home. The broad view of brand perception is SUNFLEX with Solarlux being the more premium door. Both SUNFLEX and Solarlux are also award-winning doors across the architecture, design and construction sectors. Therefore we would consider these two doors as the more premium and luxurious. To understand why you need to look at the fine details. The quality of the components, the detail in small items like the door catches, the way they slide and fold. These two doors are 100% made in Germany if this is important too. The quality of Schuco doors also depends on where you buy them. In particular, SUNFLEX and Solarlux offer quality consistency because only they make their doors. 2. Who supplies your German bi folding doors is important. The second consideration is the source of the doors. Schuco is the odd one out amongst these four top brands. On the one hand, Schuco approves their fabricators to supply them with materials. Schuco, of course, wants their doors well-made by professional manufacturers. On the other hand, there are many places to buy Schuco bifolds. Some installers happily declare the source of their doors. Others conversely do not. With Schuco doors made by many different manufacturers, there is a risk of differing levels of quality and service. By comparison, the single-source of Solarlux and SUNFLEX ensures consistent service levels and quality every time. Therefore to confidently buy Schuco bifolding doors, finding out who makes them helps you buy better. Not every Schuco door is the same. A standard Schuco door is excellent. However, some manufacturers make different doors. A good example is a trade fabricator like Dutemann. Based in Kent, Dutemann supplies Schuco bifolding doors for the trade. What Dutemann does is make the product better than the standard door. The Schuco door by Dutemann comes with a better Winkhaus lock allowing more flexible locking than the standard Schuco lock with less strain on the key as a result. The traffic door handles are different too, and we understand the Schuco door made by Dutemann as the only Schuco door with a 20-year guarantee. Therefore, Schuco bifolds are otherwise great doors, but unlike Weru, Solarlux and Sunflex, not the same across the supply chain. The rebranding carried out by some suppliers of Schuco we also consider unnecessary with such a strong brand name to start with. Yet big firms like Express Bifolding Doors and others have legitimate business reasons for doing so. 3. Complementary products for the bifold doors. The third factor is if you also need windows and other products. Choose a Schuco door and it is unlikely you also get Schuco windows. Many people choose to sell Schuco bifolding doors because they want to offer a premium door alongside standard doors like Visoglide bifolds from Smart Systems or Aluk folding doors. A substantial number of Origin dealers provide Schuco as well. However, few of these also choose to offer Schuco windows. Many of these also offer a Schuco sliding door but that is where the loyalty to the brand ends. For windows, residential doors, or front doors they choose other systems. Consequently, it becomes difficult to locate a residential supplier of the full Schuco range. But they do exist. By comparison, SUNFLEX and Solarlux provide a full range of home improvement products under one brand. The benefit to the homeowner is having one brand with one point of guarantee in their home. SUNFLEX offer sliding doors, frameless doors, front doors, interior doors and garden rooms. Solarlux provides a big range too. Weru is the same. Finally, Solarlux and SUNFLEX offer timber as well as hybrid products also giving you more choice. If you need other products and not just bifolds, Schuco may be too restrictive as a brand without extensive research. But othewise, if you just need bifolds, these are excellent as stand-alone doors in your home. 4. Cost of German bi folding doors. The perception of German bi folding doors is higher prices. As better-engineered products with more premium hardware and more luxurious feel, expect to pay more. The new SUNFLEX SF55e is one product to consider alongside Reynaers, Schuco, Express, Kloeber and Origin. Not only does this give you virtually all the stand-out features of the SF75, but it also comes at a very affordable price. At the same time, Schuco ASS70FD models come at affordable prices thanks to their wide availability. Top features of German bi folding doors. Above all, these beautiful doors offer quality, reliability and are a joy to own. Much of the quality comes in the fine details — for example, the gasket arrangement discreet as well as offering finger-safe gaskets. The aesthetics of German doors become immediately evident with these being slimmer and more attractive than other brands. Place these doors next to one of the builders favourite brands and stop for a minute to look at them. The differences in design, handles and how they work is certainly obvious. Also look beyond the overall appearance. Study the door catches, look at how the components sit within the frame. Next, operate the locking system and open the doors several times with the handles. Then lock and unlock the intermediate panels as well as open and close the doors several times. You can then compare these to other doors you see. The best features of German bifolding doors. We’ve created a quick guide giving an overview of the best features of each of these bifolding doors. Equally important is your supplier. Not only must you love your doors, at the same time you want confidence in the installer. In addition to these key features, there are many others. Our advice is to see the doors, ask questions but also ensure they meet your needs. There are, of course, other German brands also available in the UK. For instance doors and windows in PVCu and timber materials as well as frameless versions. Our article concentrates on the popular bifolding door brands. Contact us for further information, where to buy or to ask a question. Can you please tell me where I may see the Solarlux ,and Sunflex bi folds doors at a location near to my postcode. Hello Lynne, for Solarlux I think your nearest is Thames Valley Windows in Berkshire. 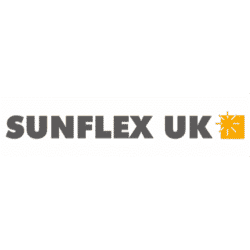 However, if you get in touch with Sunflex directly, they can hopefully put you in touch with a more local installer.